I actually hadn’t been to Burger King since they were overtaken by Wendy’s as the number two fast food chain. Since then, they’ve put a lot of effort into redefining their image. The King is gone, and their focuses on their unique sandwiches and drinks to set them apart from the competition. While they’ve introduced a line of cafe style beverages and chicken bites like McDonald’s, I’m eternally grateful that they still seem to be dedicated to burgers, unlike their golden-arched competition. Even the fonts they’re using are more clean-cut. 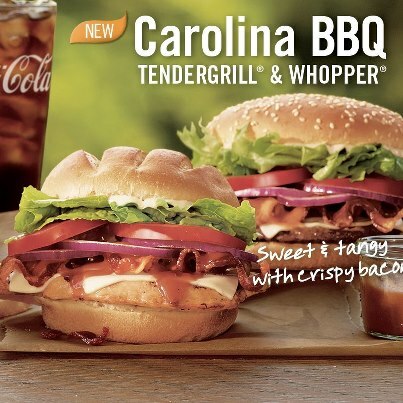 I just wish I had better things to say about the Carolina BBQ Whopper. The Carolina BBQ tops a 1/4 patty with pepper jack cheese, bacon, onion, lettuce and tomato, and finishes it all off with a sweet southern BBQ sauce. All the elements are fine, if unremarkable. I don’t claim to be an expert on BBQ so I can’t tell you how authentic the sauce is, but it’s nice that they’re acknowledging the different styles and heats of various sauces. The problem is that there’s way too much lettuce and bun in this sandwich. I understand that BK generally doesn’t double up on Whopper patties, but the lack of meat in the sandwich really hurt it in my eyes. I don’t know if I can recommend it in good conscience. One thing I can recommend are the sweet potato fries. I know it’s outside of the blog’s purview, but I wanted to say something nice, and these fries are great. They’re a bit on the salty side, but they’re made from real sweet potatoes, and you can taste the difference. I was skeptical of them initially but they’re totally worth checking out. So in closing, skip the Carolina BBQ, but don’t write Burger King off entirely. I admire the way they’re not trying to change over into a weird coffee shop thing the way McDonald’s is. BK just released a new line of chicken sandwiches, and I hope to review them soon. Stay tuned! Another day, another cool sandwich contest. This time, TLC has paired with Panera Bread for a “create your own sandwich” event, with a bunch of cool prizes. First place is $10,000 cash, a $500 Panera gift card, free Panera bagels for a year, and your creation will be featured at Panera Bread locations nationwide. All entries will be judged (on a meticulous scoring system, with “taste appeal” and “creativity of sandwich” being the main factors) and twenty finalists will be submitted to the public for voting. 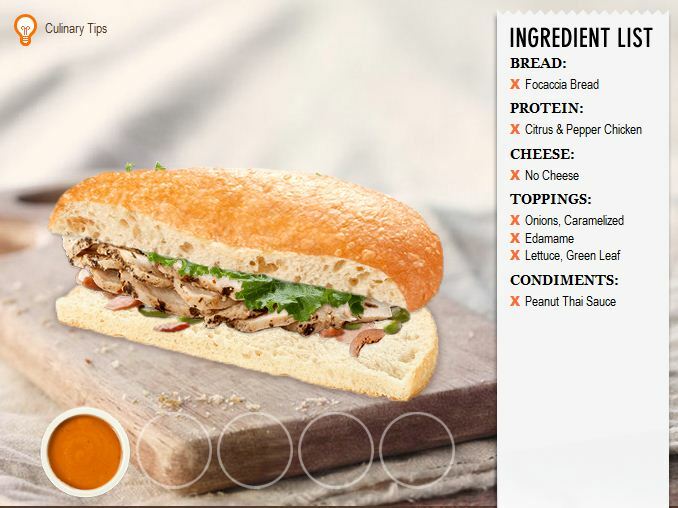 It’s a fun idea, and it’s worth trying if only to see how many cool ingredients Panera offers. Like the People’s Burger at Red Robin, I’ve thrown my hat into the ring with the Fusion Chicken Satay Focaccia. I tried to translate some of my favorite Thai food into a grilled sandwich, with a blend of Eastern and Western vegetables. Obviously, the very concept of a sandwich is somewhat rare in Pacific Asian cuisine (the Bahn Mi notwithstanding), but I feel like I did it justice. I’d encourage everyone to enter, and be sure to post your recipes in the comments here. Voting starts Oct. 22, I’ll be sure to remind everyone. A lot. Too much, probably. I’m going to admit upfront that this review kind of stretches the definition of “sandwich.” Personally, I’ve refined my idea of what a sandwich is to be a food item/filling (normally meats, cheeses, or vegetables, or a combination of those) wrapped in bread, for ease of eating (in that you use your hands). This concept includes wraps, hot dogs, tacos, and the like, but not, for example, ravioli. It also includes Tornados, a brand of taquito-type snack foods sold at finer convenience stores nationwide. Tornados consist of a fried corn crust wrapped around any number of fillings. The most common variants tend to include steak and chicken, Tornados have been filled with everything from sausage and eggs to apples and cinnamon to meatballs and marinara sauce. The key to these little products is that they can be cooked on the same rollers as hot dogs, allowing nearly anyone with a concession stand-style hot dog roller to sell them. It was this ingenuity which first drew me to them. Tornados are generally pretty good, as cheap, greasy snack food goes. I tend to like options with cheese over others, and the breakfast versions can be hit or miss. The key is that they’re only about a dollar apiece, and they’re a hot entree that’s not a hot dog you can buy from a gas station or convenience store. I wouldn’t recommend going out of your way to try one, but next time you’re at the gas station (or if, like me, you live a couple blocks away from a Circle K), pick one up. Trust me, there are worse ways to spend a dollar.